Welcome to Georgia Tech! We’re excited that you’ll be living on campus, and we look forward to sharing all the details you will need as you transition into life at Tech. The on-campus housing application for new first-year students opens January 12. New Transfer & New Graduate students may apply for on-campus housing. Important dates for Georgia Tech Housing residents. Visit Items to Bring (and what not to bring). Consider the need for a microwave and refrigerator for your room. Contact your roommate to discuss who will bring what! Check out the Room Specifications page to see what is already in your room. Tour your building and room online. If you have questions, call GT Housing at 404.894.2470. To check in, go directly to your Area Office or designated location. PICKING UP YOUR KEY IS CHECKING IN regardless if a student spends the night or is dropping off their belongings. There will be a $50 per night per student additional charge made to your Bursar account for early move-in. 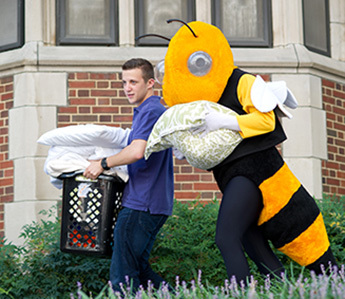 Bring your own dolly or hand-truck for a quicker move-in. To assist you in your travel plans, see Move-in Tips and residence hall street addresses as there will be an increase in traffic volume and congestion during this time. Living on campus will give you the complete Georgia Tech experience. See what Georgia Tech Housing has to offer first-year students. The First-year Experience Program is a self-selected living option designed to help 1st year residents build a solid personal and academic foundation within the context of a diverse and inclusive community. The foundation of the First-year Experience is organic — eating together and living in traditional-style residence halls starts building a strong community among the incoming class. Learn what you should bring and what you cannot bring. We get asked a lot of questions. We have a lot of answers for you. Living Learning Communities are an academic strategy that link academics to on-campus living. Each Georgia Tech community is an integrated experience that promotes interactions between faculty and students, fosters collaboration among students, improves student GPA, enhances campus and civic engagement, increases retention, and eases both the academic and social transition to college.